If you’re planning to record sound with your camera work, a microphone is going to be top of your list of things to buy. You’ve got a lot of choice, so take the time to look through everything we have to offer before you make your final decision. The sort of work you’ll be doing will impact on what types of microphones you need, so have a think about whether you need to invest in a range of different ones. The majority of microphones that are supplied with new camcorders are omni-directional and pretty basic, so you’re likely to find yourself wanting to opt for a higher quality, shotgun directional mic instead. At ProAV, we have microphones both wired and wireless for all sorts of applications. We have been careful to stock a variety of brands including Sennheiser, Sony, Beyer and Rode, as well as many others, so you can be sure of finding one that suits you. 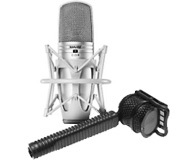 We also stock all of the accessories for the microphones including foam or hairy covers, offset brackets and pistol grips, so you can get everything you need in one order. If you’d like some more information on the different microphones we stock or have any questions, please give us a call on 01442 292929 and we’ll be happy to go through everything with you.